A third ship, the Cygnet is preparing to set sail, bound for South Australia. This vessel along with the Duke of York and the John Pirie all remain in the English Channel. This week we continue to follow the voyage of Captain Morgan onboard the Duke of York and read of the exciting news he receives from home. 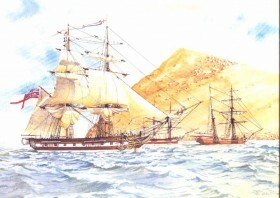 Representation of the ship John Pirie by the artist John Ford. South Australian Maritime Museum collection. We also look at the livestock that was onboard each of the vessels and inquire into the purpose these animals had for the journey and establishment of a new colony. What types of livestock and produce were brought to South Australia onboard these ships? Why were animals taken onboard? How were the animals looked after during the voyage? What exciting news did Captain Morgan receive this week? What risks were associated with childbirth for mothers and babies in the nineteenth century? Explore the concepts of childbirth, cargo, transport, agriculture and farming. Pose questions about the types of animals brought to South Australia and the reasons they were taken onboard. Explore how these animals were used in the new colony. What were the consequences of introducing these animals into the Australian environment? Using a SWOT analysis framework in order to make considered judgements on issues. Examine the differences between introduced species and native animals. How did communication with family and acquaintances impact on a passenger’s journey to South Australia? What emotions were felt by Captain Morgan and his wife, separated from each other when their daughter was born? Developing oral language skills through discussion and presentations. Exploring the features and structure of written language genres (magazine articles). 1. Captain Morgan is overjoyed to receive exciting news from home. How do you think he celebrated this news? The journal entry dated 17th March, onboard the Duke of York makes reference to the distribution of magazines. (a) Write a short magazine article about the birth of Captain Morgan’s child and what he may have done to celebrate this occasion. (b) Write an article that highlights how the weather and ‘adverse winds’ are causing challenges for the departure of these vessels. 2. We know that the John Pirie was a schooner and is the smallest ship that set sail for South Australia, with a length of 19 metres (62 feet 3 inches), a beam length of 6.1 metres (20 feet 1 inch) and depth in the hold of 3.4 metres (11 feet 1 inch). (a) How many feet and inches are there in a metre? (b) Use string to measure out the size of the John Pirie on the school oval / asphalt. Consider the livestock that was kept on this vessel. How much space was left for the 28 passengers and their possessions? Use the vessel description on this blog to help you. Discuss, could you endure these confined conditions for a long period of time? 3. The livestock were kept in confined conditions onboard. Use this blog to find out which types of animals were taken onboard. Draw a plan to show how you would keep these animals onboard one of the vessels, ensuring the safety and needs of both the animals and passengers. 4. What potential challenges lie ahead for the livestock when they arrive in Australia? Consider the weather and Australian native animals that might be a threat. Use a SWOT analysis framework to identify the strengths, weaknesses, opportunities and threats in bringing and keeping livestock in Australia in 1836. 5. When livestock was brought to South Australia in 1836, there were no quarantine regulations in place. Over the years, quarantine processes have changed dramatically. It is thought that the quarantine station on Torrens Island, at the mouth of the Port River was first used in 1855. Use the South Australian Primary Industry and Resources website to develop a timeline that shows significant events in South Australia's quarantine past. What are the current quarantine procedure for bringing animals to South Australia? What if the livestock became sick when the vessel was further out to sea? What would be the fate of the animal(s)? 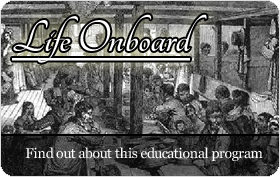 What measures would the crew take to ensure spread of diseases was kept to a minimum? Will the weather conditions improve enough for these vessels to make it beyond the Isle of Wight? Next week we take a closer look at the vessels, the passengers and livestock onboard.